Sonoma State is home to a plethora of dining venues that are sure to satisfy your taste buds! From the warm eatery of Charlie Brown's Cafe, to the bustling smorgasbord at The Kitchens, we have something for everyone! Check out the game at Lobo's or take in the tree-lined view at Overlook for your next classy meal. Please note many venues are closed or have limited hours during non-academic year sessions. The Kitchens is SSU’s residential dining hall. The contemporary dining experience will satisfy your hunger for fresh, sustainable and nutritious food that embraces Sonoma County cuisine. Seven unique platforms and a rotating menu features a variety of options for everyone. The Kitchens is located on the first floor. Sip offers various Starbucks’ signature beverages from espresso drinks and tea to pastries and grab-and-go items, including sandwiches, parfaits and canned drinks. Sip is located on the first floor. Weyden + Brewster is your destination for the ultimate DIY experience with a variety of local and healthy options. Create your own customized burrito, sandwich, or salad. Other options include soup, pizza by the slice, burgers and fries for when you’re on the go. W+B is located on the first floor. Lobo’s is the campus pub that offers salads, specialty pizzas, sandwiches and all the classic appetizers along with desserts. Lobo's is located on the first floor. Overlook has tree line views paired with scrumptious cuisine. 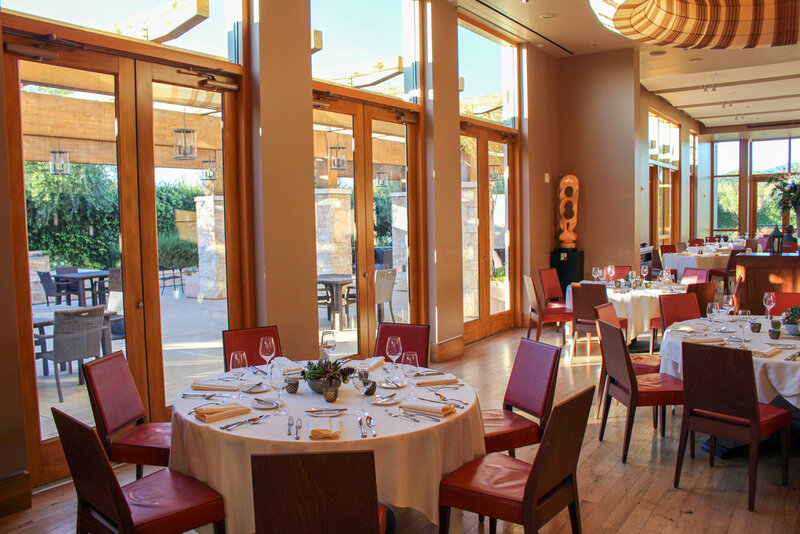 Overlook offers a rotating menu of hand-crafted American cuisine with all things fresh and local. Overlook is located on the third floor. Charlie Brown’s Café is a cozy cafe that offers paninis, daily soup specials, a plethora of quick-bites, as well as a wide variety of cold and hot beverages including specialty espresso drinks, frappes and fresh smoothies. Charlie Brown’s Café is located outside the first floor entrance of the campus library. Enveloped in understated elegance and located within the Green Music Center campus, Prelude Restaurant and Bar features exemplary culinary creations with exquisite attention to detail. Prelude's bright and flavorful menu will pull from the bounty of locally grown foods from Sonoma County. Stomping Grounds is a new dining venue, which offers scenic views alongside a menu full of healthy options. The menu includes a variety of breakfast, lunch and dinner options. Stomping Grounds is located in the Wine Spectator Learning Center. Toast offers a variety of quick grab-and-go items including sandwiches, pastries, coffee, and a great mix of beverages. Toast is located in the heart of campus between Stevenson and Darwin Halls.